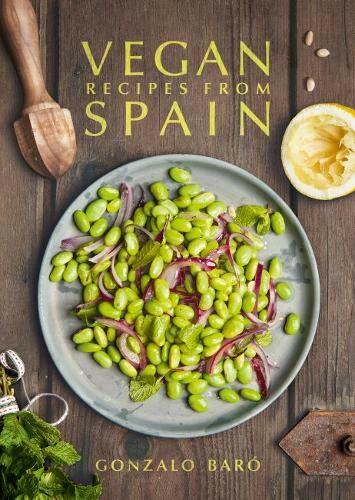 "a must for any home cook who wants to learn more about the intricacies of Spanish cuisine." A good cookbook has a distinct voice, great recipes and inviting photos. Chef Gonzalo Barò has combined his passion for photography and cooking into his latest book Vegan Recipes from Spain. Cooking was a family affair in Barò’s home. His mother Matilde was “skillful the way she held things, always with such coordination.” When the family traveled to Barò’s grandparents’ villa, meals became a celebration. Here traditional paella was cooked in a huge pan over an open fire by the men in the family. Baro developed a taste for good food and fresh ingredients from those early encounters with his mother and the men in his family. His stay in Baden, a town near Vienna, gave him insight into a different culinary culture but it was the Spanish cuisine that was dear to his heart. Even though meat, poultry, and fish are important components of Spanish cuisine, Baro manages to create enticing recipes without these ingredients. This healthy version of Spanish food is sure to delight Vegans. Barò begins with a brief, but interesting history of Spanish cuisine. Spain’s diverse landscape and climate zones helped create a unique culinary experience. The intermingling of various cultures, from the Moors to the Romans, has influenced Spanish cuisine. Techniques such as frying, grilling, and baking were brought to Spain by Greeks, Phoenicians, Moors, Romans, and Visigoths. The discovery of the American territories in the 1490s brought in garlic, onions, carrots, and rice, which were all incorporated into the modern Spanish cuisine. Central Spain’s hot dry summers and cold wet winters gave birth to hearty stews, cured cheeses, and ruby red Tempranillo wines. Endless olive groves and sandy dunes in the south became known for tapas and the famous gazpacho soup. The Mediterranean coast with its sub-tropical climate is renowned for rice dishes, including the tasty paella dish. The most famous of all Spanish foods is tapas. Tapa literally means lid, and Barò describes it as being a piece of bread topped with a slice of cheese or cured ham that was placed over a glass of wine to preserve its aroma or to simple stop anything from falling into the liquid. Tapas have come to represent the universal appetizer, one that involves sharing small plates of foods among friends and family. Barò introduces readers to pincho, a lesser known appetizer from northern Spain. Pincho, which translates into pointed stick, often refers to a small open sandwich or canape, held together by a toothpick or skewer. While tapas are regularly served with drinks at many Spanish bars, pinchos have to be ordered from the bartender and require much more elaborate preparation methods. Cold and hot pinchos are available at most bars. The book is divided into six sections. The Basics section includes directions for making basic vegetable broth, herb dressing and sauces such as Mojo Verde and Romesco Sauce. In this section, cooks can also try out traditional Alioli, that mouth-watering garlic and oil sauce from Catalan. The second section is devoted to Spain’s famed Tapas. Dishes include intriguing combinations of flavors, vegetables and sauces. Aubergine (eggplant) with Black Treacle (molasses) or Edamame with Mint and Lemon are just two of the nine tapas featured in this section. The pincho section features more complicated recipes such as Aubergine and Apple Mousse with Asparagus, Almonds and Chili oil or Tapenade with Courgette (cucumbers) and Blanched Cherry Tomato. For a flavor sensation try the Potatoes with Papaya Mojo or the pretty Roasted Colored Carrots with Shallots and Mint. The Starters section features a variety of options from Pan-seared Lettuce Hearts to Oliaigua: Minorcan-style Cream of Vegetable Soup. Some recipes like the Green Beans in Tomato Sauce are simple and use familiar ingredients. For cooks who want to challenge themselves, there are a number of complex recipes in the Main Courses section. The famed Vegetable Paella or Rioja-style Potato and Chorizo (vegan) Stew are challenging and rewarding taste sensations. After all the savory flavors, time to try out some vegan-style sweets in the Dessert section of the book. From Tiger Nut (not really a nut, but a tiny tuber) Milk to Coconut Almond Crème Caramel, there are 11 recipes to choose from in this section. The ingredients are listed in the order of preparation which makes it easy to follow and prepare. The directions, on the whole, are straight forward and simple. Some names like aubergines or courgette may take some time to get used to, but the ingredient list is easy to understand. Even though there is no glossary of terms, most of the Spanish words and terminology are fairly obvious. The book is punctuated with Barò’s colorful photography and some of the shots are truly spectacular. Even though the writing in the introduction is a little awkward and clunky, on the whole, this cookbook is a must for any home cook who wants to learn more about the intricacies of Spanish cuisine. It is a bonus that the vegan style recipes are healthy and eco-friendly. Meera Klein is the author of My Mother's Kitchen: A Novel with Recipes, a finalist for multiple awards and winner of the 2015 International Book Award for Multi-Cultural Fiction. Her work has also been published in the poetry anthology As/Us: Writers of the World, Eternal Snow, Blue Moon, and other publications.